i had my first big fud challenge at the weekend. me and mama and dada went to oma and opa’s house. they’re dada’s parents. 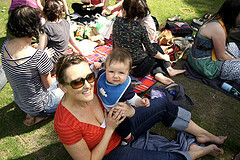 and auntie rachel and phil were there and uncle peter and jenny too. so there was a big table in the kitchen. it was bigger than normal because opa magicked it bigger, he’s very good at things like that. i sat at the corner in my new chair between mama & dada. on our way to oma & opa’s we stopped in ikea. oma & opa and mammo have highchairs for me already, but you have to shove towels around me to sit up, and i’m still all slippy and slumpy, and i won’t eat well and i’m grumpy when i’m in them. so i got 2 new chairs for their houses. 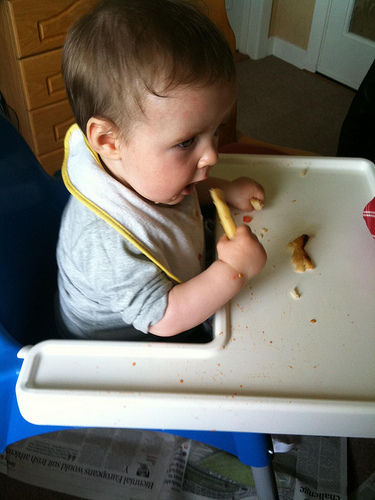 my parents are very happy with them even though they’ve a very fancy stokke tripp trapp for me at home, mama says its her very 2nd favouritist high chair. so there i was with all the people looking at me in a place i’m not used to eating in, in a new chair – mama didn’t think i’d really eat much but i did! 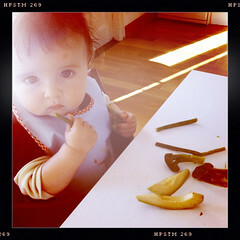 Oma is very excited by BLW so she had put aside some food for me specially. mama made sure there was lots of newspaper down because oma has carpet in her kitchen but i dropped hardly anything. I ate roast parsnip for the first time it was nummy and sweet. 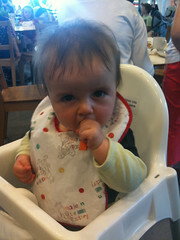 I had some carrot too, and some tomato from mama’s salad, and some roast pepper from her dinner too. then because everyone else was so slow eating, I had a good play with my shaky stacky froggy toy auntie rachel & uncle phil got for me. i had a lovely day. I went to Ikea today with mama and that Auntie Fiona one today. I got to sit in the famous Antilop highchair. Though i think its only famous to mama who reads everything about babies on the internet. I ate carrot & cucumber while they chatted and drank tea and coffee and ate muffins. Mama says to daddy that they should be eating the same as me and setting a good example, but I see her all day and she eats all kinds of things that I don’t get to eat, like chipsticks and chocolate biscuits. As soon as I can reach them i’m going to try them too if she doesn’t stop me. Auntie Caca wanted to give me cake at KK’s birthday party picnic yesterday but mama said no. I think she’ll say no a lot. Caca bought me a smashing new sunhat to the picnic too, i’ll have to do a pose in it. I do like presents. Then for dinner I ate straight from the table. I think Mama’s already fed up of extra washing up. I had avocado, green bean & broccoli. 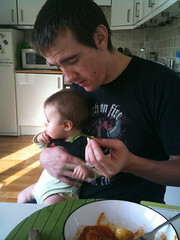 After a bit I decided I wanted to hang out with daddy, and we ate green beans together. He might be a better influence than mama for eating. I hear he has 2 dinners sometimes.